While electric cars remain a niche technology, electric buses are surging. Some are battery-electric (this is popular in China, and some North American agencies are also buying into this technology), but in Europe what’s growing is in-motion charging, or IMC. This is a hybrid of a trolleybus and a battery-electric bus (BEB): the bus runs under wire, but has enough battery to operate off-wire for a little while, and in addition has some mechanism to let the bus recharge during the portion of its trip that is electrified. One vendor, Kiepe, lists recent orders. Esslingen is listed as having 10 km of off-wire capability and Geneva (from 2012) as having 7. Luzern recently bought double-articulated Kiepe buses with 5 km of off-wire range, and Linz bought buses with no range specified but of the same size and battery capacity as Luzern’s. Iveco does not specify what its range is, but says its buses can run on a route that’s 25-40% unwired. Transit planning should be sensitive to new technology in order to best integrate equipment, infrastructure, and schedule. Usually this triangle is used for rail planning, but there’s every reason to also apply it to buses as appropriate. This has a particular implication to cities that already have large trolleybus networks, like Vancouver, but also to cities that do not. IMC works better in some geographies than others; where it works, it is beneficial for cities to add wire as appropriate for the deployment of IMC buses. Alert reader and blog supporter Alexander Rapp made a map of all trolleybus routes in North America. They run in eight cities: Boston, Philadelphia, Dayton, San Francisco, Seattle, Vancouver, Mexico City, Guadalajara. Vancouver’s case is the most instructive, because, like other cities in North America, it runs both local and rapid buses on its trunk routes. The locals stop every about 200 meters, the rapids every kilometer. Because conventional trolleybuses cannot overtake other trolleybuses, the rapids run on diesel even on wired routes, including Broadway (99), 4th Avenue (44, 84), and Hastings (95, 160), which are in order the three strongest bus corridors in the area. Broadway has so much ridership that TransLink is beginning to dig a subway under its eastern half; however, the opening of the Broadway subway will not obviate the need for rapid buses, as it will create extreme demand for nonstop buses from the western end of the subway at Arbutus to the western end of the corridor at UBC. IMC is a promising technology for Vancouver, then, because TransLink can buy such buses and then use their off-wire capability to overtake locals. Moreover, on 4th Avenue the locals and rapids take slightly different routes from the western margin of the city proper to campus center, so IMC can be used to let the 44 and 84 reach UBC on their current route off-wire. UBC has two separate bus loops, one for trolleys and one for diesel buses, and depending on capacity IMC buses could use either. On Hastings the situation is more delicate. The 95 is not 25-40% unwired, but about 60% unwired – and, moreover, the unwired segment includes a steep mountain climb toward SFU campus. The climb is an attractive target for electrification because of the heavy energy consumption involved in going uphill: at 4 km, not electrifying it would brush up against the limit of Kiepe’s off-wire range, and may well exceed it given the terrain. In contrast, the 5 km in between the existing wire and the hill are mostly flat, affording the bus a good opportunity to use its battery. In a city without wires, IMC is the most useful when relatively small electrification projects can impact a large swath of bus routes. This, in turn, is most useful when one trunk splits into many branches. Iveco’s requirement that 60-75% of the route run under wire throws a snag, since it’s much more common to find trunks consisting of a short proportion of each bus route than ones consisting of a majority of route-length. Nonetheless, several instructive examples exist. In Boston, the buses serving Dorchester, Mattapan, and Roxbury have the opportunity to converge to a single trunk on Washington Street, currently hosting the Silver Line. Some of these buses furthermore run on Warren Street farther south, including the 14, 19, 23, and 28, the latter two ranking among the MBTA’s top bus routes. The area has poor air quality and high rates of asthma, making electrification especially attractive. Setting up wire on Washington and Warren Streets and running the Silver Live as open BRT, branching to the south, would create a perfect opportunity for IMC. On the 28 the off-wire length would be about 4.5 km each way, at the limit of Kiepe’s capability, and on the 19 and 23 it would be shorter; the 14 would be too long, but is a weaker, less frequent route. If the present-day service pattern is desired, the MBTA could still electrify to the northern terminus of these routes at Ruggles, but it would miss an opportunity to run smoother bus service. In New York, there are examples of trunk-and-branch bus routes in Brooklyn and Queens. The present-day Brooklyn bus network has a long interlined segment on lower Fulton, carrying not just the B25 on Fulton but also the B26 on Halsey and B52 on Gates, and while Eric Goldwyn’s and my plan eliminates the B25, it keeps the other two. The snag is that the proportion of the system under wire is too short, and the B26 has too long of a tail (but the B52 and B25 don’t). The B26 could get wire near its outer terminal, purposely extended to the bus depot; as bus depots tend to be polluted, wire there is especially useful. More New York examples are in Queens. Main Street and the Kissena-Parsons corridor, both connecting Flushing with Jamaica, are extremely strong, interlining multiple buses. Electrifying these two routes and letting buses run off-wire on tails to the north, reaching College Point and perhaps the Bronx on the Q44 with additional wiring, would improve service connecting two of Queens’ job centers. Moreover, beyond Jamaica, we see another strong trunk on Brewer Boulevard, and perhaps another on Merrick (interlining with Long Island’s NICE bus). Finally, Providence has an example of extensive interlining to the north, on North Main and Charles, including various 5x routes (the map is hard to read, but there are several routes just west of the Rapid to the north). The examples in New York, Providence, and Boston are, not coincidentally, ungridded. This is because IMC interacts poorly with grids, and it is perhaps not a coincidence that the part of the world where it’s being adopted the most has ungridded street networks. A bus grid involves little to no interlining: there are north-south and east-west arterials, each carrying a bus. The bus networks of Toronto, Chicago, and Los Angeles have too little interlining for IMC to be as cost-effective as in New York or Boston. In gridded cities, IMC is a solution mainly if there are problematic segments, in either direction. If there’s a historic core where wires would have adverse visual impact, it can be left unwired. If there’s a steep segment with high electricity consumption, it should be wired preferentially, since the cost of electrification does not depend on the street’s gradient. Overall, this technology can be incorporated into cities’ bus design. Grids are still solid when appropriate, but in ungridded cities, trunks with branches are especially attractive, since a small amount of wire can convert an entire swath of the city into pollution-free bus operation. A higher-resolution image (warning: 52 MB) can be found here. The background image is taken from OpenStreetMap. Python 2.7 code for automatically downloading tiles and pasting them into a single image can be found here. Make sure you get PIL or else the paste.py file won’t run; first run tiles.py, and choose whichever tiles you’d like (the boundaries I used for this image are given in the paste.py code as x1, x2, y1, y2), and then run paste.py, changing the x1, x2, y1, y2 variables in the code as needed. As a warning, pasting images together makes them much bigger – the sum of the individual tiles I used is 15 MB but pasted together they became 46 MB. Local stations are denoted by black circles, express stations by bigger circles with white filling. On four-track lines and three-track lines with peak-direction express trains (that is, the 2, 6, and D in the Bronx and the 7 in Queens), the local/express designation is straightforward. Two-track tails are denoted as all local; for the most part the trains continue as express on the three- or four-track lines, but on the Brighton Line the expresses keep turning at Brighton Beach while the locals are the trains that go into Coney Island. On a few two-track segments stations are denotes as express and not local, for example the 2 in Harlem or the A in Lower Manhattan and Downtown Brooklyn: this occurs when a two-track line turns into a three- or four-track line farther out, so that people don’t get the impression that these are local-only stations that the express trains skip. The local and express patterns are barely changed from today. On Eastern Parkway trains run local east of Franklin Avenue, without skipping Nostrand and Kingston-Throop as the 4 does today. Skip-stop on the J train is eliminated, as is express-running between Myrtle and Marcy Avenues. On Queens Boulevard and Central Park West, the trains serving Sixth Avenue (i.e. the orange ones) run express and the ones serving Eighth (i.e. the blue ones) run local, but I’m willing to change my mind on at least one of these two designations; on Queens Boulevard, 36th Street is also turned into an express station, so that passengers can transfer to 63rd or 53rd Street. As far as possible, I’ve tried to be clear about which stations are connected and which aren’t. The rule is that circles that touch or are connected by a black line denote transfer stations. However, in the lower-resolution version it may hinge on a single pixel’s worth of separation in Downtown Manhattan. The only new interchanges in Downtown Manhattan connect the 1 with PATH in the Village and at World Trade Center (and the latter connection also connects to the R, E, and 2/3). No existing subway station is slated for closure. If an existing subway station is missing a circle, it’s an error on my part. Edit: I found one mistaken deletion – the 9th Street PATH station (which should be connected with West 4th, but the West 4th circle doesn’t touch PATH). Most of this map should be familiar to people who have followed discussions among railfans in New York (and not just myself) about the next priorities after Second Avenue Subway. Utica and Nostrand are there, with stops that match nearly all of the east-west buses. Northern Boulevard, which Yonah Freemark pointed is a denser corridor than Utica, is also there. Triboro RX is there: the route through the Bronx includes a little more tunneling to connect with the 2 train better, forced by incursions onto the right-of-way farther north. LaGuardia gets an elevated extension of the N, which I’ve periodically argued is superior to other alignments and sound in its own right. Second Avenue Subway continues west under 125th Street, providing crosstown service on a street where buses are very busy despite being slower than walking. In New Jersey, a hefty proportion of the lines already exist, as part of PATH or the Hudson-Bergen Light Rail. PATH is completely dismembered in this proposal: the line from Newark to World Trade Center is connected with the 6 train, an idea that I don’t think is a top priority but that some area advocates (such as IRUM) have proposed; most of the rest is turned into a 7 extension and connected with the two southern HBLR branches, both of which are extended, one to Staten Island and one to Newark; what remains is reduced to a shuttle from Hoboken to Sixth Avenue. Note that the 6-PATH train also gets an infill stop at Manhattan Transfer for regional rail connections. The 6 is extended to Co-op City, the 7 is extended to College Point, and the 1 to the edge of the city. The first two are big ridership generators, and all three also extend lines beyond their bumper tracks, increasing turnback capacity. The Queens Boulevard express trains branch in Jamaica, as they do today, and both branches are extended to near city limits. The southern extension also increases turnback capacity (some E trains run to Jamaica-179th and not Jamaica Center today for this reason), but the primary purpose is to improve coverage to areas of the city that are already at worst missing middle density and redevelopable as mid-rise apartment blocks, and have very long commutes today. The 1 is extended to Red Hook. This was proposed by AECOM a few years ago; my alignment differs somewhat in that it doesn’t connect Red Hook with the subway within Brooklyn, but does connect it directly with South Brooklyn, where in the event of such a subway extension a high-frequency bus (the B71) could run onward. Instead of the periodically mooted 7 extension to Secaucus, the L is extended there, with a four-track tunnel under the Hudson providing for easy 7/L transfers. There’s a preexisting bellmouth for connecting the C train to New Jersey across the George Washington Bridge; it is activated in this plan, with an extension to Paterson elevated over Route 4, with tunneling within Paterson itself. Route 4 is a freeway, but it’s flanked by shopping centers in Paramus, has good regional rail connections and good potential connections if the Northern Branch and West Shore Line are reactivated, and terminates in a dense working-class city. The old Erie Main Line gets converted to subway operations, running elevated through the built-up area of Secaucus. To connect some of the new lines to one another, two new Manhattan trunk lines, both two-track, are built: under 50th Street, and under Third Avenue, the latter substituting for phases 3 and 4 of Second Avenue Subway in order to avoid reverse-branching. Third then connects to the northern reaches of Eighth Avenue Line via a super-express line, with new stations at 110th and 125th; the alignment through Central Park is designed to allow cheap cut-and-cover construction. Bergenline Avenue, where traffic fills a bus every 2 minutes, gets a subway. One station is designed for a commuter rail transfer to new Hudson tunnels with a Bergenline stop. The segment south of Journal Square is weaker and can be removed from scope, but as it can be done in an existing above-ground right-of-way, it’s also cheaper than the rest. The D train gets a two-stop extension to the north to connect to Metro-North at Williams Bridge and the 2 train at Gun Hill Road. There is no subway connection to JFK or Newark Airport on this map. The JFK AirTrain is adequate with better regional rail and fare integration; so is a Newark connection at the current commuter rail station. A direct JFK regional rail connection may be included in a 9-line regional rail map (for reference, the map I usually peddle has 5 or 6 trunk lines, not 9). A Newark rapid transit connection may be included in a much more expansive version, but even then it’s unlikely – the only reason to build such a connection is for extra capacity, and it’s better to resolve mainline rail capacity crunches by building more mainline rail. There is no R train to Staten Island, an extension that some railfans (including myself many years ago) periodically call for; this could be added, but is a low priority, as regional rail could provide faster service to Downtown Brooklyn with a transfer than the R train ever could. But the biggest absence is Second Avenue Subway phases 3 and 4. Phase 3 is replaced with a subway under Third Avenue, and phase 4 is omitted entirely. The reason for this omission is, as mentioned above, to avoid reverse-branching, and permit the new system to consist of separate lines without track-sharing, which is more reliable than today’s heavily interlined system. Phase 4 is also difficult and not all that useful. Lower Manhattan construction is sometimes necessary but should be avoided when it isn’t, as the area has narrow rights-of-way, complex underground station footprints, and archeology going back to the 17th century. There is no capacity crunch heading to Lower Manhattan – southbound trains unload in Midtown in the morning peak – and the area is so small and has so many subways that there is no coverage gap that Second Avenue Subway would fill. Even phase 3 mostly duplicates the Lexington Avenue Line, but serves a large and growing business district in East Midtown where trains do have a capacity crunch, hence the Third Avenue subway. The map has around 110 km of new subway and 100 km of new els and other open-air lines (such as the Triboro and Erie rights-of-way). Some of the subways can be built cut-and-cover given sufficient political cajoling, including Nostrand, most of Bergenline, parts of Third and Utica, Northern, and the outer Queens extension. But many cannot: there are 6 new river crossings (50th*2, 7, L, Utica, 1), a kilometer of pure pain in connecting the 6 with PATH, another PATH pain involving a new Exchange Place dig for platforms for the 7, and some new stations that have to be mined (e.g. 50th Street). At what I consider a normal first-world cost, the tunnels would be around $25 billion in last decade’s money, so maybe $30 billion in today’s money, and the els would add around $10 billion. To put things in perspective, the current five-year MTA capital program is spending $33 billion, nearly all of which is routine maintenance. It’s affordable within a decade if the region gets its construction costs under control. I’ve sporadically discussed how some countries or regions have traditions of how to build rapid transit. For example, in a City Metric article last year I made an off-hand comment about how communist bloc metros, from Europe to North Korea, have widely-spaced stops just like Moscow, while French metros and French-influenced Montreal Metro have short stop spacing just like Paris. I intend to write some posts covering different traditions, starting from one I’ve barely discussed as such: the American one. There are commonalities to how different American cities that build subways choose to do so, usually with notable New York influences, and these in turn affect how American transit activists think about trains. For the most part, the American tradition of rapid transit should be viewed as one more set of standards, with some aspects that are worth emulating and others that are not. Most of the problems I’ve harped on are a matter of implementation more than a matter of standards. That said, that something is the local tradition does not immediately mean it works, even if on the whole the tradition is not bad. Some of the traditions discussed below definitely increase construction costs or reduce system effectiveness. 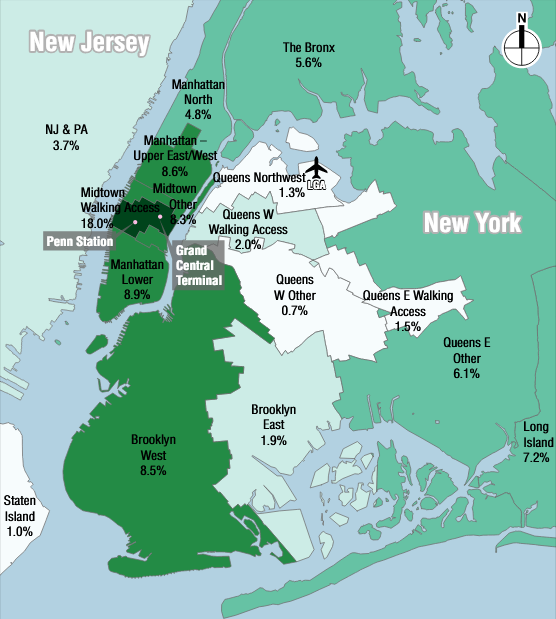 A large majority of American rapid transit ridership, about two thirds, is in New York. The city’s shadow is so long that the systems built in the postwar era, like the Washington Metro and BART, were designed with New York as a reference, whether consciously or not. Only the Boston subway and Chicago L are old enough to avoid its influence – but then their elevated system design still has strong parallels in New York, whether due to direct influence or a common zeitgeist at the end of the 19th century. Thus, the first stop on the train of thought of the American rapid transit tradition must be New York practice. 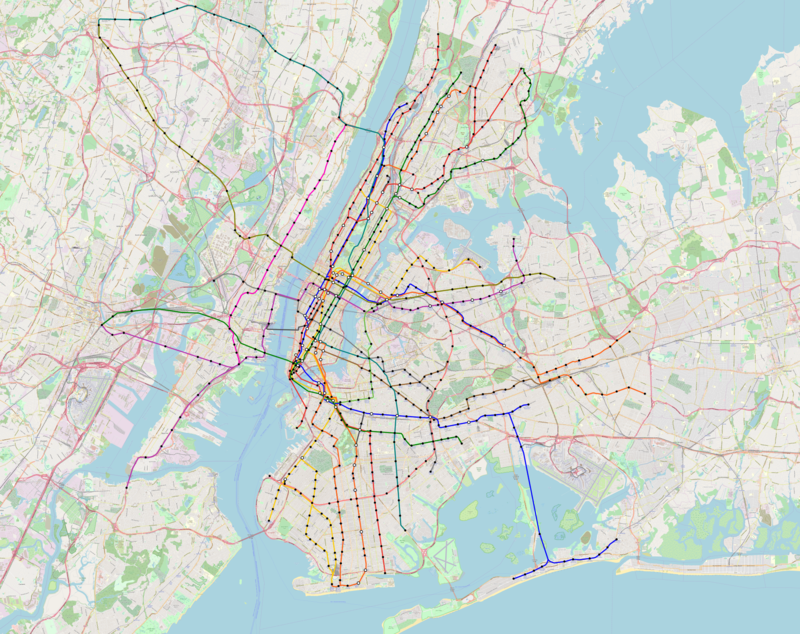 New York has nine subway main lines. Five are north-south through Manhattan and four-track, three are east-west and two-track, and one avoids Manhattan entirely. Nearly all construction was done cut-and-cover between 1900 and 1940, forcing lines to hew to the street network. As New York has wide, straight streets, a trait shared with practically all American cities, this was not a problem, unlike in London, where carving right-of-way for the Underground was so difficult that every line from the third onward was built deep-bore. With four tracks on most of the Manhattan trunks, there is local and express service. This allows trains to go around obstacles more easily, increasing redundancy. It’s in this context that New York’s 24/7 service makes sense: there is no absolute need for nighttime maintenance windows in which no train runs. This approach works less well on the two-track lines, and the L, the only one that’s two-track the entire way, has occasional work orders with very low train frequency because of single-tracking. Outside the core of the city as it was understood during construction, lines run elevated. The standard New York el is an all-steel structure, which reduces construction costs – the First Subway’s subway : el cost ratio was 4:1, whereas today the average is about 2.5:1 even though tunneling uses the more expensive boring technique – at the cost of creating a boombox so noisy that it’s impossible to have a conversation under the tracks while a train is passing. Moreover, splitting the difference between two and four tracks, the standard el has three tracks, which allows peak-direction express service (on the 2/5, 6, and 7) or more space for trains to get around obstacles (on the 1, 4, and N/W). Because the els are so noisy, the city stopped building them in the 1920s. The lines built in the 1930s were all underground, with the exception of one viaduct over an industrial shipping channel. Moreover, from the 1930s onward, stations got bigger, with full-length mezzanines (the older stations had no or short mezzanines). Track standards increased, leading to an impressive and expensive array of flying junctions, contrasting with the flat junctions that characterize some older construction like the Chicago L or some foreign examples like much of the London Underground. Finally, while New York has nine separate subway colors, its number of named lines is far greater. The system comprises several tens of segments called lines, and each route combines different lines, with complex branching and recombination. The infrastructure was never built for discrete lines with transfers between them, but rather for everywhere-to-everywhere one-seat rides, and service choices today reinforce this, with several outer lines reverse-branching to an East Side and a West Side Manhattan trunk. I know of five urban rail networks with 24/7 service. One is the Copenhagen Metro, which is driverless and built with twin bores, making it easy for service to single-track at night for maintenance. The other four are American: the New York City Subway, PATH, PATCO, and the Chicago L. Moreover, the LIRR runs 24/7, which no other commuter rail system I know of does, even ones where an individual outlying station has comparable ridership to the entire LIRR. The other systems have somewhat of a 24/7 envy. I’ve heard lay users and activists in Washington and the Bay Area complain that the Washington and BART shut down overnight; BART itself feels it has to justify itself to the users on this question. Right now, BART’s decision to temporarily add an hour to the nighttime shutdown window to speed up maintenance is controversial. People are complaining that service is being cut despite increases in funding. In Washington, the more professional activists understand why 24/7 service is unviable, but like BART feel like they have to explain themselves. New York is full of four-track mainlines, running both local and express trains. Chicago and Philadelphia have them as well on one line each. The other rapid transit networks in the US don’t, but like 24/7 service desire it. Washington has enough complaints about it that regular reader and Patreon supporter DW Rowlands had to write an article for Greater Greater Washington explaining why it would not be all that useful. BART is the more interesting case. In any discussion of BART extensions, people bring up the fact that BART can’t skip stops – never mind that its stop spacing is extremely wide owing to its function as suburban rail. The average speed on BART is 57 km/h per the National Transit Database; the RER A, which is the express service here, averages around 50. At BART’s speed, the single longest express segment in New York not crossing water, the A/D between 125th and 59th Streets, would take 7 minutes; in fact it takes about 9. If anything, BART errs in having too few stations in Oakland and San Francisco. On new-build systems, four tracks are understandable and desirable, provided the construction method is cut-and-cover, as it was in early-20th century America. The earliest subway lines built in New York had little cost premium over London and Paris even though the tunnels were twice as wide for twice as many tracks. However, cut-and-cover is no longer used in developed countries owing to its heavy impact on merchants and residents along the way; already during WW2, Chicago dug the tunnels for the Red and Blue Lines of the L using deep boring. A city that bores tunnels will find that four-track tunnels cost twice as much as two-track tunnels, so it might as well built two separate lines for better coverage. New York, Boston, Philadelphia, and Chicago all built all-steel els. While cheaper, these structures are so noisy that by the 1930s they became untenable even in far-out neighborhoods, like on the Queens Boulevard Line. New lines in New York were underground; existing els were removed, quickly in New York and more slowly in Boston. The newer systems built in the US avoided els entirely. BART planned to build one in Berkeley, but community opposition led to a change to an underground alignment; unlike subsequent examples of NIMBYism, Berkeley was willing to pay the cost difference. When tunnels are infeasible due to cost, American rail networks prefer at-grade rights-of-way, especially freeway medians. Rail rights-of-way are popular where available, such as on the realigned Orange Line in Boston, but freeway medians are common where rail alignments don’t exist. The next generation of American urban rail systems, unable to tunnel in city center, turned to light rail in order to keep things at-grade. Across the border, in Canada, Vancouver built els to cover gaps in the right-of-way that turned into the Expo Line, and then built concrete els on the Millennium Line and outer Canada Line to reinforce the system. These brutalist structures are imposing, but I’ve had conversations under the viaducts in Richmond, just as I have in Paris under the mixed concrete and steel structures or in Sunnyside next to New York’s one concrete el. New York did not invent reverse-branching. London has had it since the 1860s, when most South London railways ran separate trains to the City (at Cannon Street, London Bridge, or Blackfriars) or the West End (at Victoria or Charing Cross), and multiple North London railways ran trains to their traditional terminals or to the North London Railway for service to Broad Street. Paris has had it since even earlier: the railways operating out of Gare Saint-Lazare and Gare Montparnasse merged in 1851 and treated the two stations as reverse-branches allowing cities farther west to access both the Right Bank and the Left Bank. In both cities, this situation makes it harder to run coherent regional rail – in London the railways are spending considerable resources on disentangling the lines to increase frequency to South London’s many branches, and in Paris the fact that Montparnasse and Saint-Lazare serve similar destinations frustrated plans to connect the two stations with an RER tunnel. Where New York innovated is in copying this practice on rapid transit, starting with the Dual Contracts era. In Brooklyn, existing as well as new outlying lines could be routed to any number of new crossings to Manhattan; in the Bronx and Eastern Brooklyn, a desire to give branches service to both the West Side and East Side led to reverse-branching even on the numbered lines, which were built from scratch and did not involve older suburban railroads. Reverse-branching spread across the United States. Boston had it until it removed the Atlantic Avenue El, and even today, railfans occasionally talk about reverse-branching the Red Line along Massachusetts Avenue to Back Bay and Roxbury. Chicago occasionally has it depending on the arrangement of trains on the North Side; today, the Purple and Brown Lines share tracks at rush hour but then go in opposite directions on the Loop. The Broad Street Line in Philadelphia reverse-branches to Chinatown. The Washington Metro has reverse-branches in Virginia, limiting train frequency due to asymmetry at the merge points. BART designed itself to force a three-way wye in Oakland pointing toward San Francisco, Berkeley and Downtown Oakland, and East Oakland on which every pair of destinations has a direct train, or else East Oakland residents would have to change trains to access their own city center – and current plans for a second trans-Bay tube add further reverse-branches instead of using the extra capacity as an opportunity to fix the Oakland junction. Outside the United States, I know of four reverse-branches on rapid transit that is not historically regional rail: the Delhi Green Line, the Namboku and Mita Lines in Tokyo, the Yurakucho and Fukutoshin Lines also in Tokyo, and the Northern line’s two trunks in London. Of those, the last one is slowly being disentangled: its southern end will be two separate lines once the Battersea extension opens, and its northern end will, severing the line in two, once upgrades to pedestrian circulation are completed at the branch point. Historically Toronto had a three-way wye on the subway, like BART, but it caused so many problems it was discontinued in favor of running two separate lines. The most prominent feature of American rail networks is not what they do, but what they lack. American (and Canadian, and Chinese) regional rail networks remain unmodernized, run for the exclusive benefit of upper middle-class suburban office workers at the primary CBD. Details differ between cities, but even when management is theoretically part of the same agency as the rapid transit network, as in Boston, New York, and Philadelphia, in practice the commuter railroads are autonomous. There is no hint of fare integration or schedule integration. This fact influences network design more than anything else, even the low quality of steel els. Service to any destination beyond the dense urban core, which is small outside a handful of relatively dense cities, requires building new rail from scratch. This favors low-cost, low-capacity light rail, often in freeway medians. Smaller cities, unable to afford enough light rail to convince entire counties to tax themselves to build transit, downgrade service one step further and build bus rapid transit, typically treated as a weird hybrid of Latin American busways and European bus lanes. In one word, no. The American tradition of rapid transit clearly doesn’t work – just look at the weak ridership even in old cities like Boston and Philadelphia, whose mode shares compare with medium-size urban regions in the French sunbelt like the Riviera or Toulouse. Or, more precisely, it doesn’t work in early-21st century America. In the rare occasion an American city manages to round up funding to build a new subway line, I would recommend looking abroad for models of both construction methods and network design. For example, as BART keeps working on designing the second tube, I would strongly advise against new branches on the East Bay – instead, one of the two tubes (old and new) should permanently serve East Oakland, with a new Downtown Oakland transfer station, and the other should serve Berkeley and Concord. Moreover, the United States owes it to itself to aggressively modernize its mainline passenger rail network. It’s too important to let Amtrak, the LIRR, Metro-North, Metra, and other dinosaurs do what they’ve always done. Toronto’s modernization of GO Transit, named the Toronto RER after the Western world’s premier regional rail network, had wide support among transit planners, but the engineers at GO itself were against it, and Metrolinx had to drag them into the 21st century. Where the American tradition does work is in contexts that the United States has long left behind. Booming third-world cities direly need rapid transit, and while American construction costs are not to be emulated, the concept of opening up major throughfares, laying four tracks, and covering the system is sound. The mix of underground construction in city center and elevated construction farther out (using concrete structure, not louder steel ones) is sound as well, and is already seeing use in China and India. This is especially useful in cities that have little to no legacy regional rail, in which category India and China do not qualify, but most of the rest of the third world does. Globalization makes for grand shuffles like this one. Experts in the United States should go to Nigeria, Bangladesh, Pakistan, Colombia, Kenya, Tanzania, Angola, and the Philippines and advise people in these countries’ major cities about how to emulate rapid transit designs from early-20th century America. But in their home country these same experts should instead step aside and let people with experience in the traditions of Japan, South Korea, and the various distinct countries of Western and Central Europe make decisions. For the most part, the optimal average spacing between bus stops is 400-500 meters. North American transit agencies have standardized on a bus stop every 200-250 meters, so stop consolidation is usually a very good idea. But this is based on a model with specific inputs regarding travel behavior. In some circumstances, travel behavior is different, leading to different inputs, and then the model’s output will suggest a different optimum. In contrast with my and Eric’s proposal for harsh stop consolidation in Brooklyn, I would not recommend stop consolidation on the crosstown buses in Manhattan, and am skeptical of the utility of stop consolidation in Paris. In Vancouver I would recommend stop consolidation, but not on every route, not do we recommend equally sweeping changes on every single Brooklyn route. The choice of which factor to use, 2 or 4, is not exogenous to the bus network. If the network encourages transferring, then connection points will become more prominent, making the higher factor more appropriate. Whether the network encourages interchanges depends on separate policies such as fare integration but also on the shape of the network, including bus frequency. Higher average bus speed permits higher frequency, which makes transferring easier. The model does not take the granularity of transfer ease into account, which would require a factor somewhere between 2 and 4 (and, really, additional factors for the impact of higher bus speed on frequency). After the choice of factor, the most contentious variable is the walk speed and penalty. Models vary on both, and often they vary in directions that reinforce each other rather than canceling out (for example, certain disabilities reduce both walk speed and willingness to walk a minute longer to save a minute on a bus). In Carlos Daganzo’s textbook, the walk speed net of penalty is 1 m/s. For an able-bodied adult, the walk speed can exceed 1.5 m/s; penalties in models range from 1.75 (MTA) to 2 (a Dutch study) to 2.25 (MBTA). The lower end is probably more appropriate, since the penalty includes a wait penalty, and stop consolidation reduces waits even as it lengthens walk time. The factor of 2 in the formula comes from computing average wait time; for worst-case wait time, remove the 2 (but then the wait penalty would need to be adjusted, since the wait penalty is partly an uncertainty penalty). The factor of 2 in the formula comes from the fact that route-length is measured one-way whereas revenue hours are for a roundtrip. If we incorporate wait time into the model this way, then the walk and wait penalties used should be higher, since we’re taking them into account; the Dutch study’s factor of 2 is more reasonable. The conclusions below are not really changed – the optima barely increase, and are unchanged even in the cases where stop consolidation is not recommended. The average unlinked New York City Transit bus trip is 3.35 km: compare passenger-miles and passenger trips as of 2016. In theory this number is endogenous to the transit network – longer interstations encourage passengers to take the bus more for long trips than for short trips – but in practice the SBS routes, denoted as bus rapid transit in the link, actually have slightly shorter average trip length than the rest. For all intents and purposes, this figure can be regarded as exogenous to stop spacing. The stop penalty, judging by the difference between local and limited routes, is different for different routes. The range among the routes I have checked looks like 20-40 seconds. However, Eric tells me that in practice the B41, which on paper has a fairly large stop penalty, has little difference in trip times between the local and limited versions. The local-SBS schedule difference is consistent with a stop penalty of about 25 seconds, at least on the B44 and B46. As a sanity check, in Vancouver the scheduled stop penalty on 4th Avenue is 22 seconds – the 84 makes 19 fewer stops than the 4 between Burrard and UBC and is 7 minutes faster – and the buses generally run on schedule. The actual penalty is a little higher, since the 4 has a lot of pro forma stops on the University Endowment Lands that almost never get any riders (and thus the bus doesn’t stop there). This is consistent with 25 seconds at a stop that the bus actually makes, or even a little more. if we assume perfectly isotropic travel demand. In reality, a large share of bus riders are connecting to the subway, which can be seen in fare revenue, just $1.16 per unlinked bus trip compared with $1.91 per subway trip (linked or unlinked, only one swipe is needed). 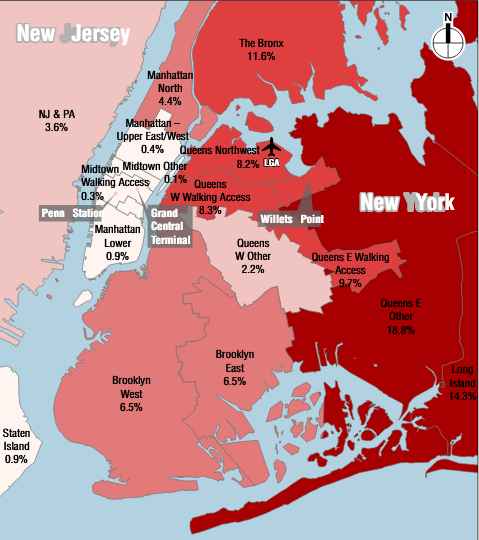 In Brooklyn, it appears that passengers not connecting to the subway disproportionately go to specific distinguished destinations, such as the hospitals, universities, and shopping centers, or Downtown Brooklyn, making the higher figure more justified. Thus, our proposed stop spacing, excluding the long nonstop segments across the Brooklyn-Battery Tunnel and between borough line and JFK, is 490 meters. Our analysis recommending 490 meter interstations in Brooklyn depends on the average features of New York’s bus network. The same analysis ports to most of the city. But in Manhattan, the situation is different in a key way: the crosstown buses are so short that the average trip length cannot possibly match city average. Manhattan is not much wider than 3 km. Between First and West End Avenues the distance is 2.8 km. The likely average trip length is more than half the maximum, since the typical use case for the crosstown buses is travel between the Upper East Side and Upper West Side, but the dominant destinations are not at the ends of the line, but close to the middle. With Second Avenue Subway offering an attractive two-seat ride, there is less reason to take the crosstown buses to connect to the 1/2/3 (and indeed, the opening of the new line led to prominent drops in ridership on the M66, M72, M79, M86, and M96); the best subway connection point is now at Lexington Avenue, followed by Central Park West. On a long route, the location of the dominant stop is not too relevant, but on a short one, the average trip length is bounded by the distance between the dominant stop and the end of the line. A crosstown bus stopping at First, Second, Third, Lex, Madison, Fifth, Central Park West, Columbus, Amsterdam, Broadway, and West End makes 10 stops in 2.8 km, for an average of 280 meters. There isn’t much room for stop consolidation. If the bus continues to Riverside, lengthening the trip to 3 km at the latitude of 96th Street, then it’s possible to drop West End. If the buses running up Third and down Lex are converted to two-way running, presumably on Lex for the subway connections, then Third could be dropped, but this would still leave the interstation at 330 meters, much tighter than anything we’re proposing in Brooklyn. The only other places where avenues are too closely spaced are poor locations for stop removal. Amsterdam and Broadway are very close, but Amsterdam carries a northbound bus, and if the Columbus/Amsterdam one-way pair is turned into two two-way avenues, then Amsterdam is a better location for the bus than Columbus because it provides better service to the Far West Side. Fifth and Madison are very close as well, but the buses using them, the M1 through M4, are so busy (a total of 32 buses per hour at the peak) that if the two avenues are converted to two-way running then both should host frequent bus trunks. It’s not possible to skip either. Within Brooklyn, there is one location in which the same issue of short bus routes applies: Coney Island. The B74 and B36 act as short-hop connectors from Coney Island the neighborhood to Coney Island the subway station. The routes we propose replacing them have 7 stops each from the subway connection west, over distances of 2.5 and 2.7 km respectively, for interstations of 360 and 390 meters. Vancouver supplies two more examples of routes similar to the B74 and B36: the 5 and 6 buses, both connecting the West End with Downtown. The 6 is only 2 km between its western end and the Yaletown SkyTrain station, and the 5 is 2.3 km from the end to the Burrard station and 2.8 km to city center at Granville Street. The average trip length on these buses is necessarily short, which means that stop consolidation is not beneficial, unlike on the main grid routes outside Downtown. In Paris the average interstation on buses in the city looks like 300 meters; this is not based on a citywide average but on looking at the few buses for which Wikipedia has data plus a few trunks on the map, which range from 250 to 370 meters between stations. The short stop spacing in Paris is justified. First of all, the average bus trip in Paris is short: 2.33 km as of 2009 (source, PDF-p. 24). Parisian Metro coverage is so complete that the buses are not useful for long trips – Metro station access time is short enough that the trains overtake the buses on total trip time very quickly. Second, there is little reason to transfer between buses here, or to transfer between buses and the Metro. The completeness of Metro coverage is such that buses are just not competitive unless they offer a one-seat ride where the Metro doesn’t. Another advantage of buses is that they are wheelchair-accessible, whereas the Metro is the single least accessible major urban rail network in the world, with nothing accessible to wheelchair users except Line 14 and the RER A and B. It goes without saying that people in wheelchairs are not transferring between the bus and the Metro (and even if they could, they’d have hefty transfer penalties). The New York City Subway has poor accessibility, but nearly all of the major stations are accessible, including the main bus transfer points, such as Brooklyn College and the Utica Avenue stop on the 3/4. which is close to the midpoint of the range of interstations I have found looking at various routes. The half-kilometer (or quarter-to-a-third-of-a-mile) rule for bus stop spacing is an empirical guideline. It is meant to describe average behavior in the average city. 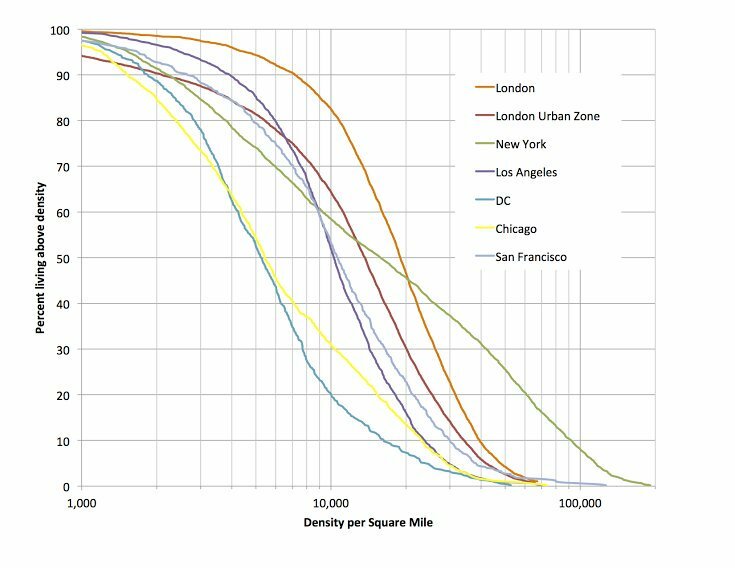 It is scale-invariant – the density of the city does not matter, only relative density does, and the size of the city only matters insofar as it may affect the average trip length. However, while scale itself does not lead to major changes from the guideline, special circumstances might. If the geography of the city is such that bus trips are very short, then it’s correct to have closer stop spacing. This is the case for east-west travel in Manhattan. It is also common on buses that offer short-hop connections to the subway from a neighborhood just outside walking range, such as the B36 and B74 in Coney Island and the 5 and 6 in Vancouver’s West End. Note that even in New York, with its 3.3 km average trip length, stop consolidation is still beneficial and necessary on most routes. North American transit agencies should not use this article as an excuse not to remove extraneous stops. But nor should they stick to a rigid stop spacing come what may; on some routes, encouraging very short trips (often 1.5 km or even less), closely spaced stations are correct, since passengers wouldn’t be riding for long enough for the gains from stop consolidation to accumulate. The theme of winners and losers has been on my mind for the last few months, due to the politics of the Brooklyn bus redesign. In a rich country, practically every social or political decisions is win-lose, even if the winners greatly outnumber the losers. It’s possible to guarantee a soft landing to some of the losers, but sometime even the soft landing is disruptive, and it’s crucial that backers of social change be honest with themselves and with the public about this. Overall, a shift from an auto-oriented society to a transit-oriented one and from dirty energy to clean energy is positive and must be pursued everywhere, but it does have downsides. In short, it changes economic geography in ways that make certain regions (like Detroit or the Gulf Cooperation Council states) redundant; it reorients economies toward more local consumption, so oil, gas, and heavy industry jobs would not be replaced with similar manufacturing or mining clusters but with slightly more work everywhere else in the world. The United States has the dirtiest economy among the large developed countries, so it’s convenient to look at average American behavior to see where the money that is spent on polluting products goes. Nationally, about 15.9% of consumer spending is on transportation. The vast majority of that is on cars, 93.1% (that is, 14.7% of total consumer spending). The actual purchase of the car is 42% of transportation spending, or 6.7% of household spending. This goes to an industry that, while including local dealerships (for both new and used cars), mostly consists of auto plants, making cars in suburban Detroit or in low-wage Southern states and exporting them nationwide. In addition to this 6% of consumer spending on cars, there’s fuel. Around 3% of American household spending is on fuel for cars. Overall US oil consumption in 2017 was 7.28 billion barrels, which at $52/barrel is 5% of household spending; the difference between 5 and 3 consists of oil consumed not by households. This is a total of about 2% of American GDP, which includes, in addition to household spending, capital goods and government purchases. This tranche of the American economy, too, is not local, but rather goes to the oil industry domestically (such as to Texas or Alaska) or internationally (such as to Alberta or Saudi Arabia). Historically, when coal was more economically significant, it was exportable too. Money flowed from consumers, such as in New York and London, to producers in the Lackawanna Valley or Northeast England; today, it still flows to remaining mines, such as in Wyoming. The same is true of much of the supply chain for carbon-intensive products. Heavy industry in general has very high carbon content for its economic value, which explains how the Soviet Union had high greenhouse gas emissions even with low car usage (15.7 metric tons per capita in the late 1980s) – it had heavy industry just as the capital bloc did, but lagged in relatively low-carbon consumer goods and services. The economic geography of steel, cement, and other dirty products is again concentrated in industrial areas. In the US, Pittsburgh is famous for its historical steel production, and in general heavy manufacturing clusters in the Midwestern parts of the Rust Belt and in transplants in specific Southern sites. All of these production zones support local economies. The top executives may well live elsewhere – for example, David Koch lives in New York and Charles Koch in Wichita (whose economy is based on airplane manufacturing and agriculture, neither of which the Kochs are involved in). But the working managers live in city regions dedicated to servicing the industry, the way office workers in the oil industry tend to live in Houston or Calgary, and of course the line workers live near the plants and mines. The direct alternatives to oil, gas, and cars are renewable energy and public transportation. These, too, have some components that can be made centrally and exported, such as solar panel and rolling stock manufacturing. However, these components are a small fraction of total spending. How small? Let’s look at New York City Transit. Its operating costs are about $9.1 billion a year as of 2016, counting both the subway and buses. Nearly all of this is wages, salaries, and benefits: $7.3 billion, compared with only $500 million for materials and supplies. This specifically excludes vehicle purchases, which in American transit accounting are lumped as capital costs. The total NYCT fleet is about 6,400 subway cars, which cost around $2.3 million each and last 40+ years, and 5,700 buses, which cost around $500,000 each and last 12 years, for a total depreciation charge of around $600 million a year combined. Compare this with cars: New York has about 2 million registered cars, but at the same average car ownership rate as the rest of the US, 845 per 1,000 people, it would have 7.3 million cars. These 5.3 million extra cars would cost $36,500 each today, and last around 20 years, for a total annual depreciation charge of $9.7 billion. Put another way, total spending on vehicles at NYCT is one sixteenth what it would take to raise the city’s car ownership rate to match the national average. Even lumping in materials and supplies that are not equipment, such as spare parts and fuel for buses, the total, $1.1 billion, is one ninth as high as buying New Yorkers cars so that they can behave like Americans outside the city, and that’s without counting the cost of fuel. In particular, there is no hope of maintaining auto plant employment by retraining auto workers to make trains, as Michael Moore proposed in 2009. The vast majority of transit spending is then local: bus and train operations, maintenance, and local management. The same is true of capital spending, which goes to local workers, contractors, and consultants, and even when it is outsourced to international firms, the bulk of the value of the contract does not accrue to Dragados or Parsons Brinckerhoff. Clean energy is similarly local. Solar panels can be manufactured centrally, but installing them on rooftops is done locally. Moreover, the elimination of carbon emissions coming from buildings has to come not just from cleaner electricity but also from reducing electricity consumption through passive solar construction. Retrofitting houses to be more energy-efficient is a labor-intensive task comprising local builders sealing gaps in the walls, windows, and ceilings. A global shift away from greenhouse gas emissions does not mean just replacing cars and oil with transit and solar power. Transit is cheaper to operate than cars: in metro New York, 80.5% of personal transportation expenditure is still on cars, and the rest is (as in the rest of the country) partly on air travel and not transit fare, whereas work trip mode shares in the metropolitan statistical area are 56% car, 31% transit. With its relatively high (for North America) transit usage, metro New York has the lowest share of household spending going to transportation, just 11.4%. This missing consumption goes elsewhere. Where does it go? The answer is low-carbon industries. Consuming less oil, steel, and concrete means not just consuming more local labor for making buildings more efficient and running public transit, but also shifting consumption to less carbon-intensive industries. This low-carbon consumption includes local purchases, for example going out to eat, or hiring a babysitter to look after the kids, neither of which involves any carbon emissions. But it also includes some goods that can be made centrally. What are they, and can they be made in the same areas that make cars and steel or drill for oil and gas? The answer is no. First, in supply regions like the Athabascan Basin, Dammam, and the North Slope of Alaksa, there’s no real infrastructure for any economic production other than oil production. The infrastructure (in the case of North America) and the institutions (in the case of the Persian Gulf) are not suited for any kind of manufacturing. Second, in real cities geared around a single industry, like Detroit or Houston, there are still lingering problems with workforce quality, business culture, infrastructure, and other necessities for economic diversification. Take the tech industry as an example. The industry itself is very low-carbon, in the sense that software is practically zero-carbon and even hardware has low carbon content relative to its market value. Some individual tech products are dirty, such as Uber, but the industry overall is clean. A high carbon tax is likely to lead to a consumption shift toward tech. And tech as an industry has little to look for in Detroit and Houston. Austin has booming tech employment, but Houston does not, despite having an extensive engineering sector courtesy of the oil industry as well as NASA. The business culture in the space industry (which is wedded to military contracting) is alien to that of tech and vice versa; the way workers are interviewed, hired, and promoted is completely different. I doubt the engineers oil and auto industries are any more amenable to career change to software. On the level of line workers rather than engineers, the situation is even worse. A manufacturing worker in heavy industry can retrain to work in light industry, or in a non-exportable industry like construction, but light industry has little need for the massive factories that churn out cars and steel. And non-manufacturing exports like tech don’t employ armies of manufacturing workers. In Germany the situation is better, in that Munich and Stuttgart may have little software, but they do have less dirty manufacturing in addition to their auto industries. It’s likely that if global demand for cars shifts to a global demand for trains then Munich will likely keep thriving – it’s the home of not just BMW and Man but also Siemens. However, the institutions and worker training that have turned southern Germany into an economically diverse powerhouse have not really replicated outside Germany. Ultimately, in a decarbonizing world, southern Germany will be the winner among many heavy industrial regions, most of which won’t do so well. A shift away from fossil fuel and cars toward green energy and public transit does not have to be harsh. It can aim to give individual workers in those industries a relatively soft landing. However, two snags remain, and are unavoidable. The first is that some line workers have deliberately chosen poor working conditions in exchange for high wages; the linked example is about oil rig workers in Alaska, but the same issue occurs in some unionized manufacturing and services, for example electricians get high wages but all suffer hearing loss by their 50s. It’s possible to retrain workers and find them work that’s at the same place on the average person’s indifference curve between pay and work conditions, but since those workers evidently chose higher-pay, more dangerous jobs, their personal preference is likely to weight money more than work conditions and thus they’re likely to be unhappy with any alternative. The second and more important snag is the effect of retraining on entire regions. Areas that specialize to oil, gas, cars, and to some extent other heavy industry today are going to suffer economic decline, as the rest of the world shifts its consumption to either local goods (such as transit operations) or different economic sectors that have no reason to locate in these areas (such as software). Nobody will be sad to see Saudi Arabia crash except people who are directly paid by its government. But the leaders of Texas and Michigan are not Mohammad bin Salman; nonetheless, it is necessary to proceed with decarbonization. It’s not really possible to guarantee the communities a soft landing. Governments all over the world have wasted vast amounts of money trying and failing to diversify from one sector (e.g. oil in the GCC states) or attract an industry in vogue (e.g. tech anywhere in the world). If engineering in Detroit and Houston can’t diversify on its own, there’s nothing the government can do to improve it, and thus these city regions are destined to become much smaller than they are today. This is bound to have knock-on regional effects. Entire regions don’t die quietly. Firms specializing in professional services to the relevant industries (such as Halliburton) will have to retool. Small business owners who’ve dedicated their lives to selling food or insurance or hardware to Houstonians and suburban Detroit white flighters will need to leave, just as their counterparts in now-dead mining towns or in Detroit proper did. Some will succeed elsewhere, just as many people in New Orleans who were displaced by Katrina found success in Houston. But not all will. And it’s not possible to guarantee all of them a soft landing, because it’s not possible to guarantee that every new small business will succeed. All policy, even very good policy, has human costs. There are ways to reduce these costs, through worker retraining and expansion of alternative employment (such as retrofitting older houses to be more energy-efficient). But there is no way to eliminate these costs. Some people who are comfortable today will be made precarious by any serious decarbonization program; put another way, these people’s entire livelihood depends on continuing to destroy the planet, and most of them are not executives at oil and gas companies. It does not mean that decarbonization should be abandoned or even that it should be pursued more hesitantly; but it does mean climate activists, including transit activists, have to be honest about how it affects people in and around polluting industries. There is relatively scant information in English about construction costs in Russia and China. Frustratingly, even Metro Report, which does have some information about China, has only a handful of Russian examples with their costs stated; from perusing the articles Wikipedia links to, even Russian originals rarely state the costs of subway extensions. Fortunately, Metro Report does have an article mentioning general costs. Be warned: the costs quoted below are somewhat higher than the specific figures I’ve found for individual projects. Tunnels, including stations and depots, cost an average of 10bn to 15bn roubles per route-km to build, with construction of an extension lasting five to six years. Cut-and-cover methods can save 2bn to 5bn roubles and up to three to four years. Additional savings could be made by using double-track bored tunnels, which first appeared in 2014-15 in St Petersburg, along with top-down station construction. At some stations in Moscow, platform arrangements are being introduced with a platform on each side of a single track so that boarding and alighting passengers do not use the same platform; this leads to a 15% to 30% saving on the overall construction cost. The PPP conversion rate is about US$1 = 24 rubles as of 2016-7. So the overall cost quoted is supposedly around $400-600 million per km, which is very high for a European country, and overlaps the American range (though the $500 million/km American subways tend not to be in city centers). In practice, the two specific lines cited in the article are cheaper, at $310 million/km for the Line 3 extension in Saint Petersburg (which is partly underwater) and $185 million/km for the Line 2 extension in Nizhny Novgorod; but both extensions have wide stop spacing even by Russian standards, and deep underground, stations dominate construction costs. Look more carefully at the quoted paragraph. Using side platforms rather than island platforms is stated to reduce costs by 15-30% – presumably overall costs, not just station costs. This is because the caverns are simpler, especially if the stations are built cut-and-cover. Cut-and-cover overall is supposed to save 20-30% of the cost, taking the 10-15 billion figure as correct and not the lower figures of the Saint Petersburg and Nizhny Novgorod lines mentioned in the piece. If the lower figures are right, the saving is around half the cost, making cut-and-cover cost about the same as above-ground construction (an above-ground Line 1 extension is projected to cost $130 million/km). I saw a different source, in French, make the same claim that cut-and-cover is about as expensive as elevated construction; I can’t find the reference anymore, but interested readers can Google “ciel couvert” and see if they can find the article. This was very much not the case in 1900-4, when New York was spending (in today’s money) around $39 million/km on the subway’s underground portions and $9 million/km on its elevated portions, but then again New York built els to be cheap and noisy, and it’s plausible that quieter concrete structures would cost more. Another plausible explanation is that cut-and-cover has gotten relatively cheaper over time due to mechanization of street digging. New York and Paris built their subways with hand tools in the 1900s. Deep boring is more mechanized, but was already somewhat mechanized at the turn of the century, so it’s not surprising if the cost trajectory in the last 120 years has been more favorable to cut-and-cover. As it is, London’s early Tube lines didn’t cost more than the cut-and-cover lines of New York or Paris, nor did they cost more in the 1930s; the cost differential is thus a recent phenomenon. Finally, on a more political point, it’s worth comparing Russia with other countries that used to be in the Soviet bloc, since they have broadly comparable incomes today and learned to build subways from the same place (i.e. the Moscow Metro and the Soviet triangle). Overall, Russian costs seem somewhat higher than in the rest of Eastern Europe: comparable to costs in Poland or a little higher, somewhat lower than Hungary (M4 was around $500 million/km), much higher than Bulgaria and Romania. Does EU membership and the package of reforms required for accession mean lower construction costs? It’s not guaranteed, but it looks like the parts of former communist Europe that joined the EU are doing better. Upper middle-income wages with good institutions can produce good results, just as the never-communist parts of Europe with comparable incomes, like Greece and Italy, have pretty low costs.